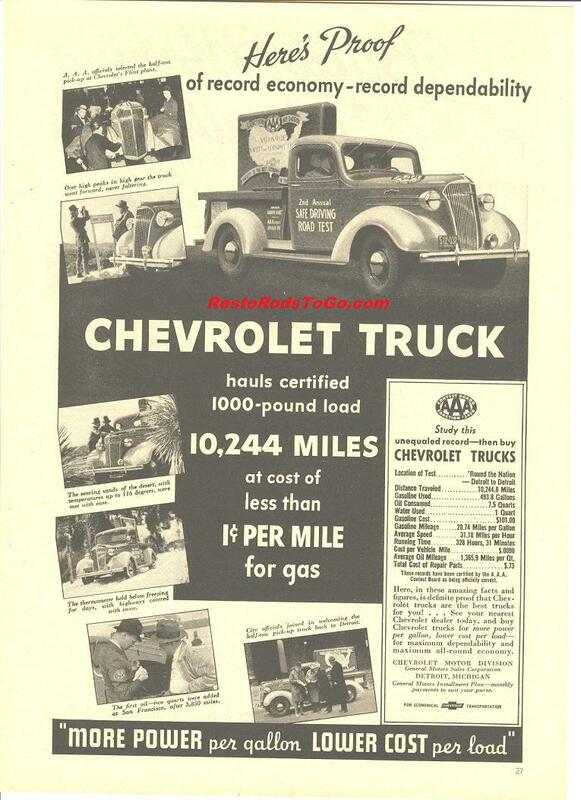 1937 Chevrolet 1/2 ton Pickup Truck hauls 1000 pound load for 10,224 miles around the nation. Detroit to Detroit in 1937. Gas was relatively expensive in 1937. At 20.5 cents a gallon, it was comparable to the price today if you figure overall inflation. The total cost to haul the 1000 pound load was less than 1 cent per mile, and the total cost of repair parts for the trip was 73 cents. This truck had the accessory, tandem wiper assembly like the one on my 1937 Chevy Truck. It also sports the single fog light like I did on mine. I know my trip around the nation in my 37 Chevy cost a lot more in 2007 but I averaged a lot higher speed as well. Their speed in 1937 was 31.18 miles per hour, but then the roads were nothing like they are today. I maintained 70 miles per hour most of the way across on the return trip.